Wilkins is one of the Tri-Towers, along with Haynie and Wright. The Tri-Towers are adjacent to Illinois State’s Redbird Arena and Hancock Stadium, and are also a short walk to Milner Library and Schroeder Hall via the Main Street underpass. 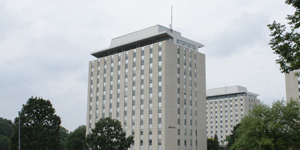 Wilkins Hall opened in 1964 and was named after Daniel Wilkins, Principal of the Wilkins Female Academy in Bloomington. Daniel Wilkins helped establish Illinois State Normal University and free public schools in Illinois. He was a member of the Teachers College Board from 1857–60 and the first Superintendent of Schools in McLean County in 1860.